Samuel Augustus "Sam" Nunn, Jr. is an American lawyer and politician. Currently the co-chairman and Chief Executive Officer of the Nuclear Threat Initiative , a charitable organization working to reduce the global threats from nuclear, biological and chemical weapons, Nunn served for 24 years as a United States Senator from Georgia as a member of the Democratic Party. His political experience and credentials on national defense reportedly made him a potential running mate for Democratic presidential candidates John Kerry and Barack Obama . 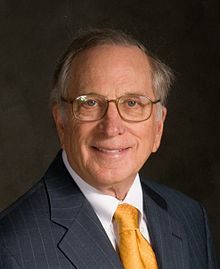 Samuel Augustus "Sam" Nunn, Jr. (born September 8, 1938) is an American lawyer and politician. Currently the co-chairman and Chief Executive Officer of the Nuclear Threat Initiative (NTI), a charitable organization working to reduce the global threats from nuclear, biological and chemical weapons, Nunn served for 24 years as a United States Senator from Georgia (1972 until 1997) as a member of the Democratic Party. His political experience and credentials on national defense reportedly made him a potential running mate for Democratic presidential candidates John Kerry (2004) and Barack Obama (2008). The race between Democrat Michelle Nunn and Republican David Perdue could help decide control of the U.S. Senate, but it might not end with Tuesday's vote.